A disaster can strike at any time. A company that does not have a sound contingency in place can be exposed to prolonged downtime, causing loss of revenue and irreversible damage to its reputation. And as companies cope with the growing amount of corporate information being generated every day, they face a daunting truth: without their data, they have no business. That’s why it’s so critical to now have a modern and dependable system in place to safeguard valuable business information. Over the last decade, cloud backup, recovery and restore (BURR) options have emerged as secure, cost-effective and reliable solutions. A cloud backup, recovery and restore solution takes advantage of your existing infrastructure, so you don’t need to buy or install expensive equipment. Cloud backup software integrates with IT environments to locate and prioritize files for backup, and then securely transmits encrypted copies of those files to offsite data centers. This results in a lower total cost of ownership compared to the purchase and maintenance of complex tape backup systems. According to International Data Corporation (IDC), the volume of data worldwide is expected to increase 50 times by 2020. However, many organizations are experiencing a high level of data growth today as they struggle to keep up with the rise in data volumes. Businesses today must identify much better approaches to data management, retention, storage, sharing, access and security in order to effectively deal with this growth. Join us as we discuss how an automated, secure cloud backup solution can remove the burden of managing the complex and error-prone data protection process. 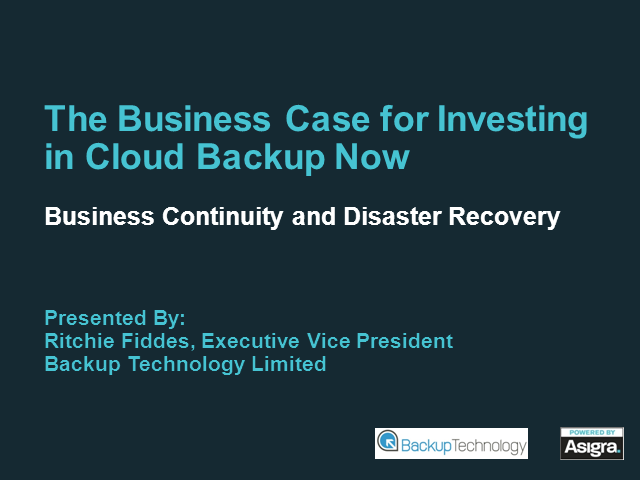 During this session we will review the trends and challenges in cloud-based data protection; continuous backup and recovery for various servers, laptops, mobile devices such as tablets and smart phones; and how to mitigate costs and risk.